A Full Meter High! : Customers are at eye-level with all that’s going on. No stretching or straining to see the television or passing trays filled with something they’re more likely to order – now that they can see it! The higher elevation means they’re not likely to be looked over by service staff and servers no longer have to bend over to deliver beverages and food. Our tables are designed for restaurants, cafes, clubs or backyards. 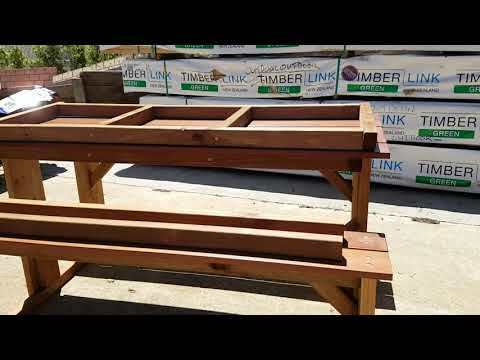 Wide-Open Walk-In Design: The only hardwood picnic table design of its kind in all Australia. Anyone, no matter how big, small, man or woman can easily walk right in and sit right down. Safety-First Aussie Craftsmanship: Rather than cut corners, we sand them so their smooth, rounded for maximum comfort and safety. Same goes for the tops and seats. We accept all major credit cards, PayPal, Cheque, and other methods of payment – just let us know what works for you. Picnic Tables come in just a few easy to assemble pieces and it shouldn’t take more than 20-minutes to put one together. We have a support line to help walk you through it if needed. 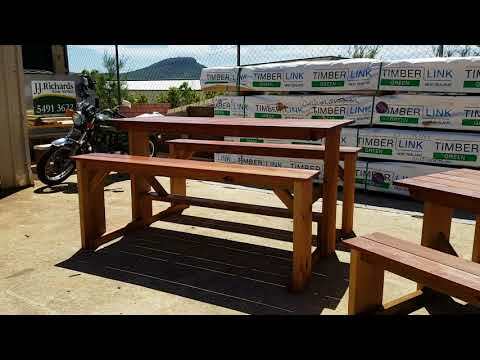 Hardwood Picnic Tables: Table and seats not stained but legs and all other components factory stained. The table top / seats should be stained oiled by you. LEGS AND OTHER COMPONENTS: We use Structural H3 LOSP (arsenic free) treated pine. All pieces are hand selected planed, sanded and routed to ensure a beautiful, safe splinter free finish. Warranty: 10-years structural warranty and 5-year workmanship warranty. Outdoor Living Plus is a major supplier of outdoor furniture for venues like hotels, resorts, restaurants, universities, schools and government organizations. Discovery Parks and many more..